On Monday, 11 March, Mr Nature Khumalo, of Amsterdam, reported another blocked sewer drain system to the Excelsior News after a resident in Amsterdam, Mr Ncongwane, asked him for assistance with the matter. According to Mr Khumalo, the sewerage sewerage leak in Amsterdam is situated in Nyembezini, Extension 4, and has been blocked for a number of years already. Mr Ncongwane reported that he frequently reported the sewerage leak in Amsterdam to the municipality and that workers occasionally came to open it, but every time (soon after the repairs), it gets blocked again. Mr Ncongwane also said that the problem is so severe that the blocked sewer drain system has resulted in his toilet not functioning properly. Every time the toilet is flushed, the sewerage pushes back up and flows into his house. He and his family are now making use of outside facilities to prevent the overflow of sewerage in their house. Apparently, this sewerage spillage is an ongoing problem and it is clear that grass and other vegetation have been growing over the spillage. The matter has been reported to the Mkhondo Local Municipality’s Communication Department as well as a representative of the Inkomati Usuthu Catchment Management Agency and feedback is pending. The relevant departments should find a permanent solution to the problem now. Winter is approaching and it is an inconvenience not to be able to use a toilet in your own home. Community members should also take note that they should not discard items such as baby diapers or sanitary towels in the toilets. These items will definitely block the system again and again. Please make sure that you only flush toilet paper and nothing else! Response received from Mkhondo Local Municipality (Communication Department) Your letter dated 11th of March 2019, on the sewerage spillage at Amsterdam. 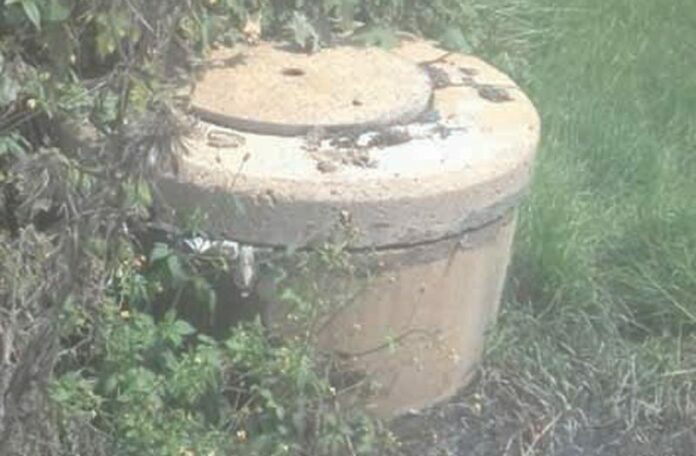 The sewer at Nyembezini Ext 4 was reported at the Amsterdam offices and was attended to. The IUCMA came to the municipality to report on the matter and the team was sent to site immediately. When unblocking the manholes, we always discover sanitary towels, diapers, hides, old clothes and sometimes dead animals. This has resulted in constant blockages along the sewer network. We respond to complaints as they are reported. Zimbali Boarding School is also connected to the existing line and uses a lot of water which increased the flow in the sewer network. During the rainy season the network is flooded with storm-water ingress resulting in the overflow of manholes. The municipality is committed in ensuring proper hygiene and dignified sanitation to all its residents. We highly appreciate the effort of the community in continuously reporting matters. We urge the public to continue doing the good work for the community and we sincerely apologize for the inconvenience caused to the Ngcongwane family and other families affected. Next articleDevan Smith is bedrywig!